Caleb von Jabora is one of the better males from Jabora kennels. Although his anatomy is very good and his colours are beautiful, his gait is his most impressing quality. 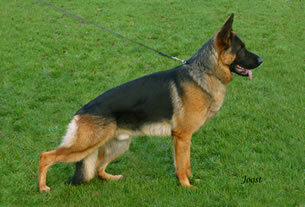 German judges used Caleb to demonstrate the audiance how the gait of a German Shepherd Dog should be. When he runs just two feet have contact with the ground: the left front- and hindleg or the right front- and hindleg. He lifts his frontlegs very high and streches them. Compare this with the gait of Quint von Jabora (picture below). You’ll see that Quint often touches the ground with three of his feet simultaneously. The correct proportions of height to length and corresponding length of the leg bones results in a ground-eating gait that is low to the ground and imparts an impression of effortless progression. With his head thrust forward and a slightly raised tail, a balanced and even trotter will have a topline that falls in moderate curves from the tip of the ears over the neck and level back through the tip of the tail.